The answer to learning a new language: Moar Cats!! Cats are a venn diagram of expressiveness, cuteness and able to be put in humorous human situations, the co-founder of Memrise, Ed Cooke tells me with a straight face, before he bursts into laughter. Memrise is the very serious U.K.-based three-year-old startup that develops crowd-sourced memory aids for learning languages, and Cooke has just launched CatAcademy, his new cat based memory learning mobile app series that uses — of course — cats as a way to increase language retention. It’s as ridiculous as it sounds. But also seems to work. Cooke is a Grand Master of Memory, which is an award that has only gone to a handful of people that can complete a series of memory feats that would quickly stump the average person. I played with CatAcademy’s brand new Spanish language app for awhile ($1 in the app store) and when you see the Cheezburger cat with the silly hat on and the words Por Favor, you actually start paying attention more. Cooke tells me that it’s all very scientific and also “it has to be cats.” “There something about cats where you’re projecting meaning onto the cat, and you process that meaning more deeply,” says Cooke, explaining that take silly cats and associate them with words and the deeper thinking can lead to better language learning. At least that’s the theory. 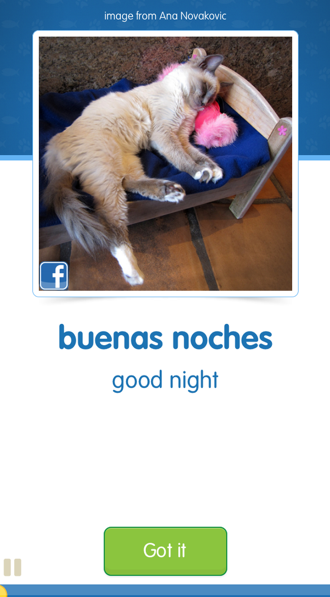 On Wednesday morning CatAcademy launched its first Spanish language mobile cat app, Cat Spanish, and Cooke says he wants to launch other language apps down the road. Think about it like a mobile app that is a combo of Rosetta Stone and LOLcats. Also if you’re a fan of British-style silly humor, Cat Spanish is full of it, with a cat professor sassing you and whimsical cat sayings. The venture-backed Memrise is a bit more sober. It’s been building a community and database of a million users that crowd source visual memory aids to help people learn languages. The community’s “mems” are meant to create vivid, sensory memories, which is where the team discovered that a good deal of the mems were cute animals. Memrise went through Tech Stars Boston and raised a $4 million round from Avalon Ventures and Balderton Capital last year. As even Google’s computer brain learned, the Internet is really just about cats. Turns out so is leaning a new language.